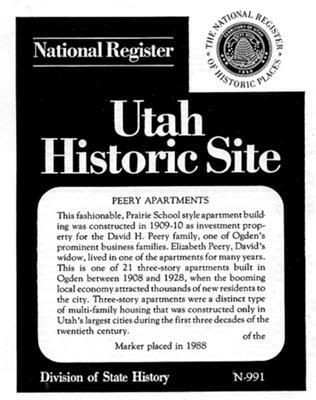 The Historic Peery Apartments were built in 1910 as an investment property for prominent Ogden businessman, D. H. Peery and his wife Elizabeth. The couple lived in a spectacular 20,000 sq. 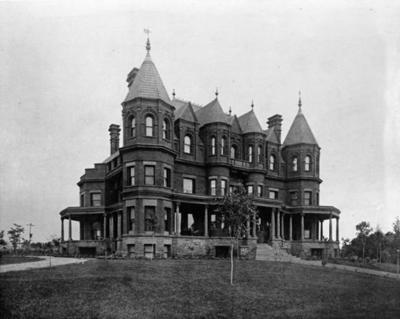 foot gothic revival mansion on the adjacent property, until D. H. Peery's death. 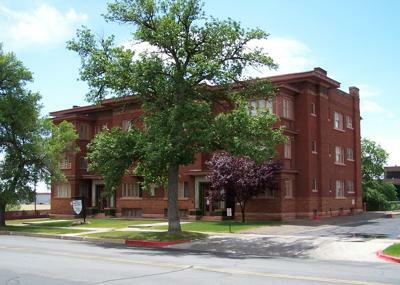 The Peery mansion was much too large for Elizabeth to live in all alone, so she moved into unit #1 at the Peery Apartments, where she lived out her days until her death in the 1920's. Elizabeth Peery still wanders the halls of the Peery Apartments and is fiercely protective of the building, becoming very interested, (active) whenever a new restoration or renovation project begins at the property. Her shadow is frequently seen by the residents as she silently navigates the building's stairwells, often passing by a unit's open front door without making a sound, although it is physically impossible for a person to traverse the 100 year old staircases without causing them to creak and groan under the weight. In January, 2010, the current owner was down in one of the building's basements working on the boiler, with his back to the door. From the doorway, a woman's voice asked, "What are you doing?" ... but when he turned to answer, there was nobody there. Assuming that the woman's voice had come from one of the building's residents, the owner began asking all of the women in the building, if it was their voice he had heard that afternoon... As it turned out, none of them had been home at the time of the incident.